In 1888 Duluth’s Lakeside Land Company, which developed Lakeside and Lester Park, advertised that it planned to build a “mammoth hotel” outfitted with “all the latest improvements.” Despite this announcement and architect Oliver Traphagen’s grand original design, the hotel was a rather plain, two-and-a-half story wood-frame building with a two-story veranda facing Lake Superior. Originally called The Lakeside House, the hotel could be reached by the Duluth and Iron Range Railway and, later, the Duluth Streetcar Rail Line, both of which ran within a block of the hotel. The hotel opened under the direction of W. B. Dow; by 1895, when Fred Pinkman took the reins, the hotel had three other proprietors. Pinkman advertised the hotel as a vacation retreat for those who enjoyed “boating, bathing, and fishing,” where “the invalid or pleasure seeker will find this the pleasantest summer resort in the Northwest, with all the comforts and conveniences of home.” Pinkman opened a restaurant in the hotel and converted it into a boarding house. In 1897 the hotel hosted teamsters hired by the city to transport steel pipe for construction of the nearby Lakewood Pumping Station. Those very teamsters may have led to the hotel’s destruction. On March 30, 1897, fire consumed the hotel. The fire started in a shed east of the building, where lamp oil was stored; it was a habit for the teamsters to fill their lanterns with oil after breakfast, and they began work well before sunrise. Pinkman speculated a dropped match or a spark from a lit pipe may have set off some spilled lamp oil that had soaked into the wood floor; a brisk east wind carried the flames to the hotel. Declared a total loss, the hotel was not rebuilt. In 1902 a house was built on the site by Dr. Joseph D. Titcomb. 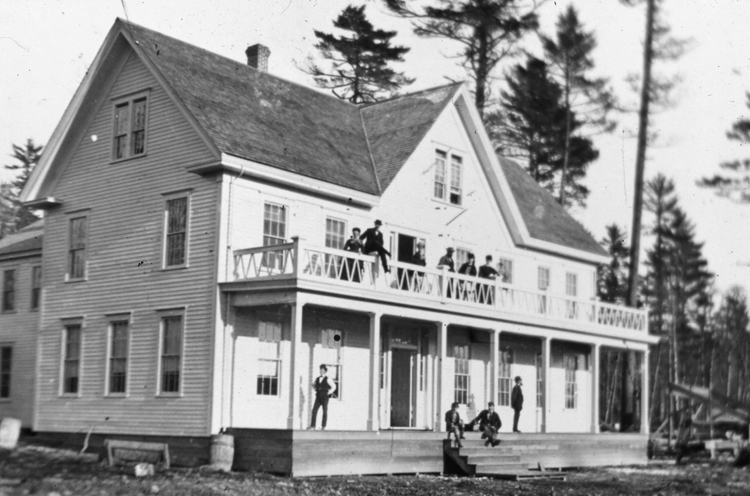 The then-rural location and access to a trout stream must have been very alluring to Dr. Titcomb. An avid outdoorsman and member of the League of American Sportsman, he once reported the Spalding Hotel for violating state law by serving quail out of season at a St. Louis County Medical Society banquet. Dr. Titcomb’s house still stands.